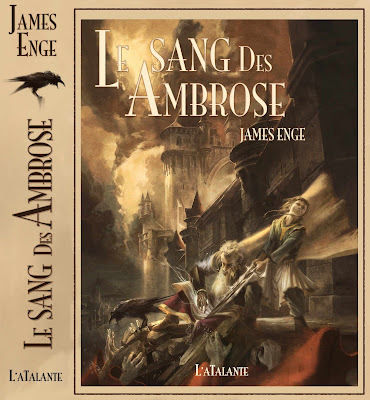 Through the Pyr’s blog, Pyr-o-mania, I found another gorgeous cover artwork, the one for the French edition of James Enge’s “Blood of Ambrose” (Le Sang des Ambrose) due to be released by L’Atalante. That the cover artwork for a French edition is amazingly beautiful is no surprise any more, but I am afraid that if I find more such book covers I will become very pretentious when it comes to this subject. The artwork is made by the French artist Frédéric Perrin, who also made the excellent covers for the French editions of Brent Weeks’ Night Angel trilogy. I like the entire artwork, the characters look great and the background is simply outstanding. I also like the spine a lot, because of the crow drew there. I love that cover! I wish it was on my copy!